This is a picture of my Grandpa with Dexter back in October 2008; two months before he passed away. 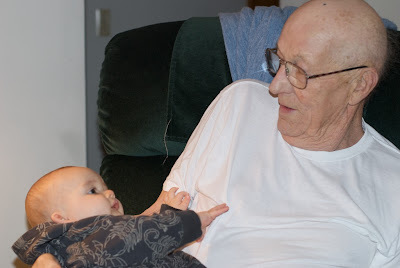 This picture always makes me smile because I was so happy that my Grandpa Tony was able to meet his first great grandson. He would have loved to see how funny and thoughtful he has turned out. My grandpa was an amazing man, actually the BEST man. He was really funny, thoughtful, kind and so generous. The world would be so much better if there were more men like him in it. Grandpa Tony served his country in the US Coast Guard on the USS Kirkpatrick During WWII. There isn't a day that goes by that I don't somehow think about my Grandpa. He did, after all, teach me how to catch a fish, drive a riding lawnmower and drink coffee with my pinkie extended. He could throw down a cribbage match at a moment's notice and sing some awesome old school country on his guitar. Whenever I hear "Oh My Darling" I will forever think of him. Rest in Peace Grandpa for you are in a better place especially now that Grandma just joined you in heaven. I love and miss you everyday. I know you are watching down on us and shining your greatness down on our family. I wish you could have met Oliver Thomas, who I proudly named after you! All my love, all the time.